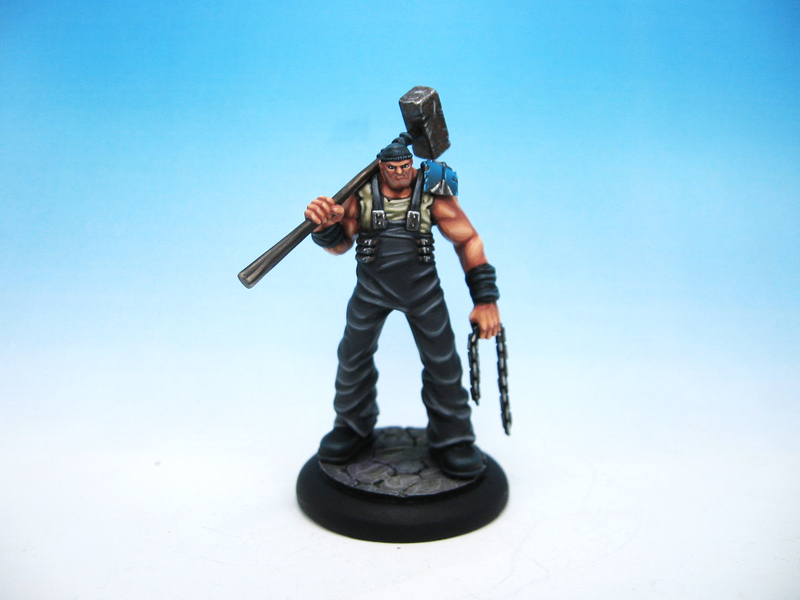 Johan is an individual model from Wyrd Miniatures. The model is about five pieces. Honestly, this might be one of the nicest models I have ever assembled and painted. The model has some interesting proportions. 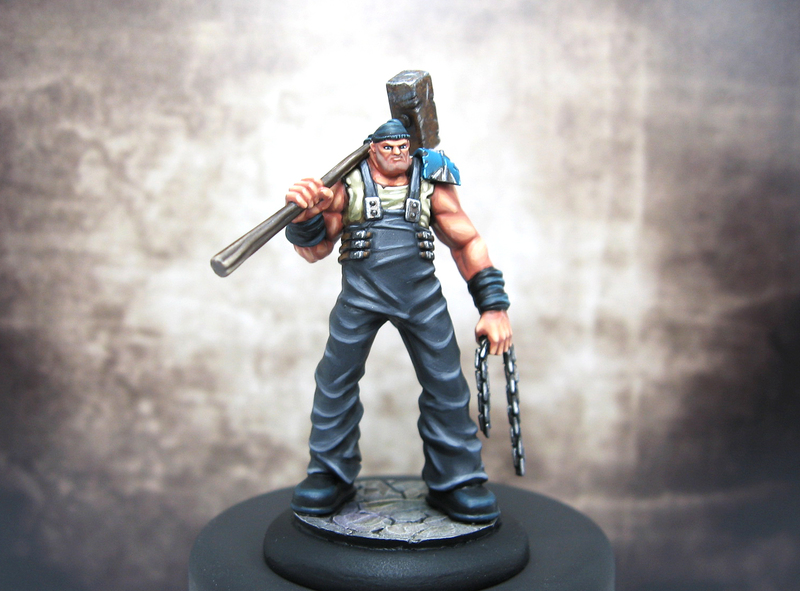 The feet and hands are huge to give the impression of the man being a giant (relative to other models in the game he is probably about 9 feet tall). The quality of the detail on the face and hands is incredible. The model was really enjoyable to paint. 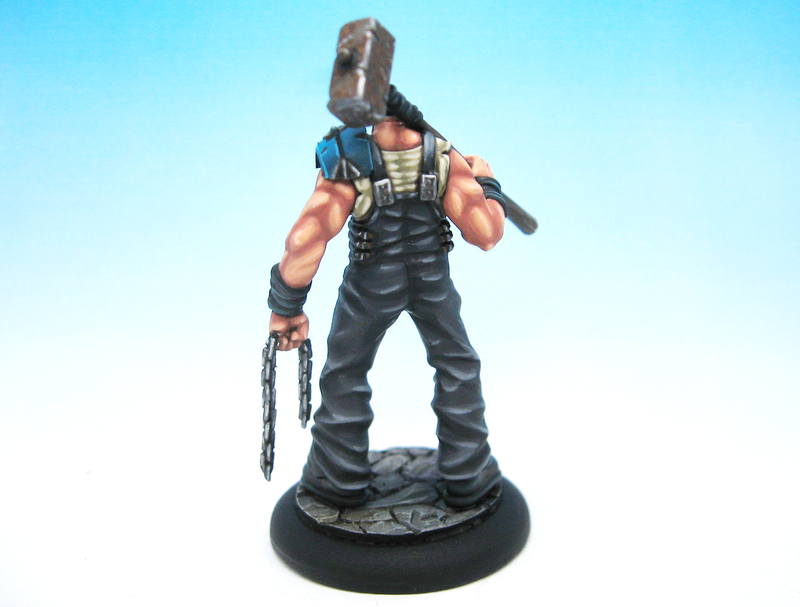 The only addition to this model was the little Chaos shoulderpad on the left shoulder. I added the shoulder pad to add some Falcon Turquoise to tie this model in with the rest of the crew. I tried a few new things with the paint job. My pictures are terrible as I misplace my usual camera. The blends on this model are smoother than usual for me. I've been using P3s Coal Black a lot on this model. I used it to highlight the black on the boots, toque, and arm wraps. I also used it to shade the shadows on his undershirt. The color is wonderfully vibrant. I mix in a little white to add the lightest highlights. The only downside is the terrible flip top bottle (I much prefer droppers). The wood was also new for me. I blended up from VMC Chocolate Brown to VGC Bone White. I find wood to be extremely challenging to paint. I'm still struggling with it. I like how the light is hitting the end of the hammer shaft. 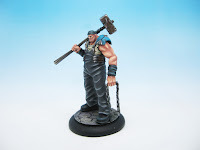 After Johan, I have another 2 models to finish for my Arcanist crew. I have the Mechanical Rider and an Arachnid Swarm to finish. The Electric Creation is finished and I'll post up some pictures later this week or next week. You can see the rest of the crew by clicking here. For you campaign players, remember to have your results in by Tuesday evening. I'd love to hear your thoughts on this model. I know most of my regular followers do not play Malifaux, but I'd like to hear your thoughts on this model. Thanks for visiting. Have never seen this sculpt before, but I like it. His legs seem very long, but that's fine for someone who's supposed to be giantish. I really like the skin tones and shading on his dungarees. It is a very interesting Sculpt. 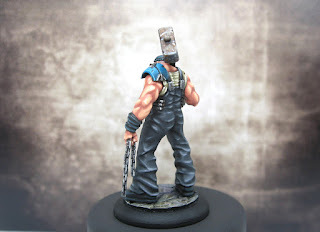 The proportions are a little weird but he looks nice when all painted. The detail on some of these Malifaux models is great. Lots of nicely shaped details for painting. Glad you like the skin and cloth. They are two things I struggle to paint well.